I’ve always loved photography. My mom was an amateur photographer when I was a kid and I remember sitting for hours looking at slides with her (yes, I’m that old). I started playing around with landscape photography when I discovered hiking. I switched to “landscape with pets” photos when I started this blog 5 years ago but, for the most part, I just stuck with the “take a landscape shot but throw a dog in there” level of effort. The current camping-and-hiking-with-dogs photo trend on Instagram has prompted me to step up my game. 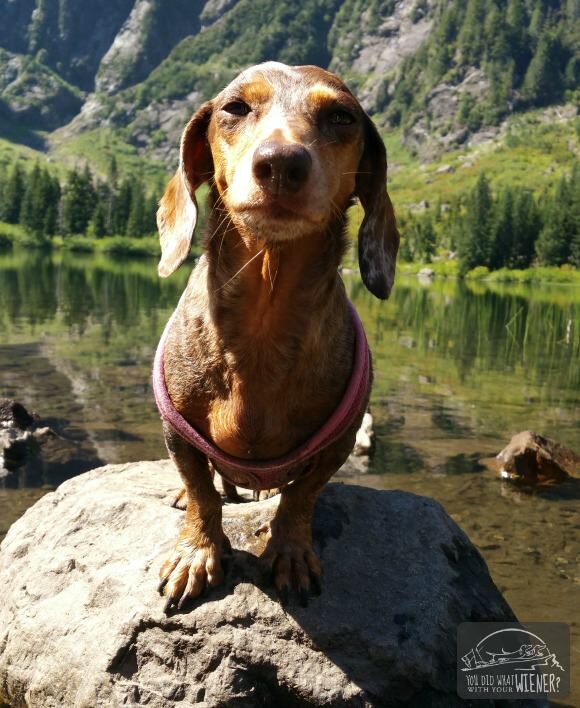 I mean, some of the photos of dogs hiking and camping on Instagram are amazing. I use my love and admiration for them as motivation and inspiration to put real effort into making my photos better. There are accounts, like @campingwithdogs, that are dedicated to curating the best of the photos on Instagram that I look at often for ideas. I want my pictures to look like that and you might too. Regardless of whether you want to improve your personal photos of your dog, or your photos for social media, you might find my secrets for getting great photos helpful. The camera you use can make a huge difference. I’m lucky – or rather I planned it that way – that my phone has an awesome camera. Samsung Galaxy Note 4 (but all my Samsung Galaxy products have had amazing cameras). I hear that iPhones also take amazing pictures. My Nikon 7100 DSLR takes way more professional and crisp pictures than my Samsung Galaxy but the benefit is mostly in the faster shutter speed and the ability to get creative with manual settings. Note: The 18-140 f/3.5-5.6G lens is amazing and pretty much all I use. If I want to get more artsy, I use my 50 mm f/1.8 lens. It’s not practical to bring or use in all cases because it’s heavy and big though (although it’s become much easier to carry in use in nice weather when mounted to my backpack strap using the Peak Design CapturePRO Camera Clip). If I don’t want to carry it, but want more control over my photos than I get on my smartphone, I bring my mirrorless camera (mini DSLR) with interchangeable lenses – a Nikon 1 J5. The bottom line is pick something with good resolution, good color depth, and know how to use it. Know the purpose of your trip before you go. Will this be a leisurely, care-free adventure or do you plan to get some great photos while also having fun? Knowing your intention and setting aside some extra time will make a big difference because photos almost always turn out better when you don’t feel rushed. If the main purpose of the trip is to snap some great photos, plan to stop for 1 – 3 “photo sessions”, for 30 – 45 minutes each, and add that time into the itinerary for the day. Picking a good backdrop takes care of a good chunk of the great-photo equation. We’re lucky here in Western Washington to have such beautiful scenery. When I was only taking landscape photos, I got a lot of compliments on my pictures. The thing is though, it’s pretty easy when all you have to do is point and shoot…. because the scenery IS amazing. There was, honestly, not much work on my part during the photo shoots. Hiking into somewhere new and being totally surprised by the scenery is great but doesn’t always make for the best photos. One way to ensure an Instagram-worthy shot is to do a Google image search for the area to find the most beautiful spots. You can also plan to revisit a destination you’ve been to before that you know has awesome scenery. Once on the trail, or at to your destination, don’t forget to be on the lookout for the small details that give a unique perspective. Some examples of interesting features the average person might not think twice about are burned out trees, mossy or colorful rocks, or little caves. The most beautiful scenery might not always yield the best photo. Photos are always better when taken completely in the shade or completely in the sun – not half shaded and half sun. The camera has a hard time adjusting when you have both really bright light shadows in the same photo. You’ll end up with darkness or no detail in the shadowed parts of the photo and blown-out colors in the bright parts. You may have to pick a not-quite-so-beautiful spot that’s entirely in the shade or sun, or capture a smaller part of the scenery, to get a more even light. I would argue that it’s always best when everything is in the shade. In the sun, you will always get some kind of shadow in your photo. The sun also tends to wash out colors so they will pop more in the shade. Also, in my case, Gretel has sensitive eyes so she’s always squinting in bright light. The type of light at the location will depend on the time of day and weather. Overcast, cool days have some of the softest light for photos, as well as sunrise or sunset. This is also why many photographers choose early morning and dusk when the sun is not directly overhead. Whether you choose morning or evening depends on when the part of the scenery you want to shoot is in the shade. You may have to do a reconnaissance hike so you can see when the best time would be. Also, stay away from flash at all costs but you won’t need it if your pet is outside in natural light anyway. A fast shutter speed will reduce blur when your dog is moving… which they almost always are. This is where using a DSLR, or mirrorless camera (see #1), comes in handy because you can adjust all of the settings in the manual mode (it’s best to stay out of auto mode). If you don’t want to mess with all of the settings, most cameras have a “shutter priority” mode where you set the shutter speed and the camera auto selects the rest for you. Chester and Gretel pretty much think any treat is “high value”. However, I really know what get’s their attention. Cheese is an especially good motivator. If you want to stay away from “people food”, the tripe treats from PetKindor Zuke’s Z-fillets are always a hit. It helps to select treats that are smelly, big enough for them to see from a distance, and that can small pieces can be broken off of to save calories. The most important commands for your dog to know during photo shoots are some kind of stay command and what I call the “look” command. You’ll get a better picture if your dog knows to sit in one place and can hold the stay, or “wait”, even when you are a distance away. Gretel had a habit of not looking at the camera, or looking at the camera and squinting, so I am teaching her the “look” command. I teach her this at home by holding a treat by my eye (a camera lens just looks like a huge eye to some dogs so this helps desensitize them to looking in “the eye”) and saying “look”. I don’t give her the treat until she is both looking at me and has her eyes open. 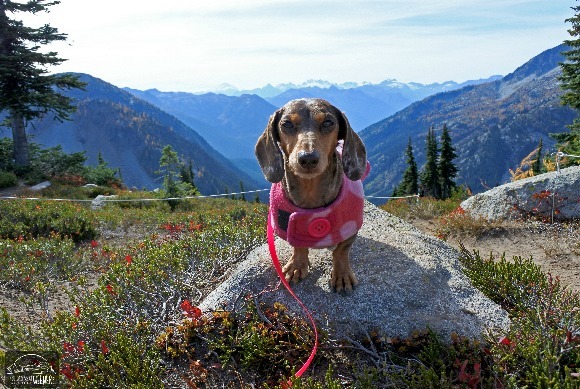 This is especially helpful with smaller dogs but, regardless of size, if the dog is on something – like a log or rock – they are more less likely to wander around while you are taking photos. They will often stay on the rock. log or whatever “posing” so all you have to do is take pictures. There are a lot of distractions for your dogs in the outdoors. I admit that I sometimes get frustrated when a photo shoot isn’t working out like I had hoped. Maybe it’s that Chester and Gretel aren’t cooperating. Maybe it’s that other people showed up at the shooting location and are in the way of the shot or distracting the dogs. Maybe it’s that my camera settings got messed up. It doesn’t matter what why: just know that your dogs can sense when you are frustrated. A photo shoot will much better if you are relaxed because your dog will be relaxed. In the beginning I took almost 100 pictures to get one or two good ones. As your dog gets the routine down, and your skills improve, that number will go down. I probably still take 10 – 20 pictures for every good one though. The great thing about living in the digital age is that I can easily scan and delete the crappy ones. Not all pictures will be winners right off the camera. Ideally, they subject will be centered or positioned according to the rule of thirds. Your dog will be looking at the camera and the horizon line will be horizontal. Sometimes you don’t get those one or two great shots so you have to make them from what you have with editing tools. A free, easy service I like to use is PicMonkey. It can help you to correct coloring and crop the photo so it looks balanced. You can also overlay it on a white background, rotate it, and crop it to straighten the horizon. I do have Photoshop and Lightroom but I barely know how to use them (although learning is on my to-do list). Another thing to remember is that you might be able to turn what looks like an out-take into a great photo. 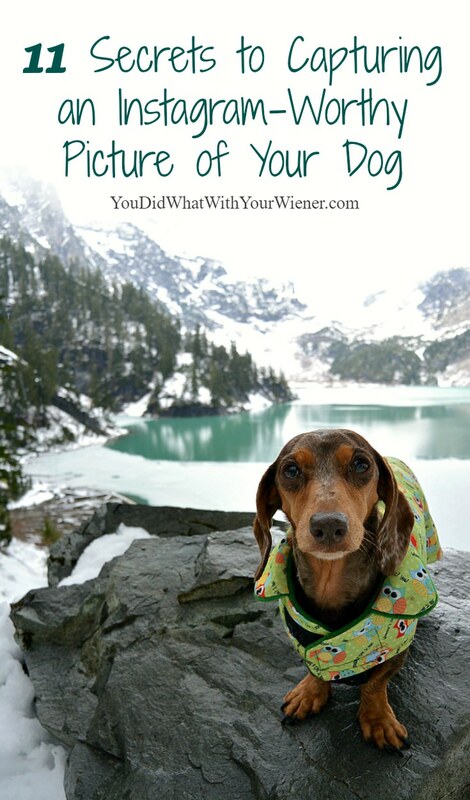 For example, if your dog is not looking at the camera you might be able to crop the photo so it looks purposeful. For example, the dog looking away could be used to draw attention to a particular part of the photo or add visual interest. 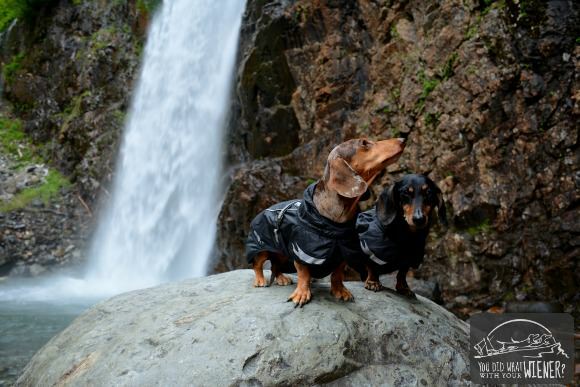 Chester is looking directly at the camera but Gretel is looking up, drawing your eye upwards to something (like maybe the top of the waterfall) out of the frame. Do you have any favorite photography tips I didn’t mention? Please leave them in the comments. All great tips Jessica! I will be sharing this for sure. Do you ever use a light diffuser in direct sun? Thanks again! Thanks. I haven’t used a diffuser because I only have two arms. I need one to hold the camera and one to hold the treats 🙂 Also, I am often over water or very uneven terrain so setting one up on a stand is not an option. If I can ever recruit anyone to come with on our photo shoot hikes I will definitely try it out though (do own a diffuser and reflectors). I rarely do actual photo shoots but I’m always ready and always snapping just in case. Sometimes the spontaneous pictures are the best! I’m working with a pack of 4 so it’s very rare to get them all posed and looking in the right direction but if I just keep shooting, I can usually catch some pretty good photos. I suppose I could spend some time training them to “look” and maybe my life would be easier but it’s kind of fun just catching what I can! A lot of times, their personalities come through better when they are allowed to be more candid. Your photos are always absolutely amazing! It takes a lot of work to get that perfect shot, but it’s great knowing that the training you do can be used for beautiful pictures too! I love your photos! I try and capture photos of my dog running and leaping through the air, but is such a fun challenge and worth it when I get a good one. I toss a stick or ball as far as I can in the opposite direction and then hunker down with my camera and toss another stick behind me and hope that he starts running towards me. Sometimes we do this like 25 times 🙂 I’d love if anyone has any advice for getting good action shots! Chester and Gretel are always figiting during photo shoots so I kind of consider my pics action shots. Ha, ha. Chester and Gretel don’t chase thigns so throwing things like that won’t work for us. It’s awesome that it does for your pup though. I wish I could get some good action shots of Chester and Gretel. The only tip I have for good shots of dogs running, jumping, etc is use a camera with a super fast shutter speed and focus time. I have a camera that shots continuously at 6 fps (frames per second) and it can freeze action pretty well. Fantastic post and your pictures are absolutely envy inducing!! I was the one who would take a picture then walk away before it “finished.” I guess that explains all the blurry ones. A few months ago I decided to get serious, I bought a camera (a Nikon Coolpix because I didn’t want to spend a fortune) and took a basic photography class just to get started. Thanks for reminding me how badly I want to take stunning pictures, and now that the weather is slowly starting to improve I’ll be going out with my camera. Thanks for the compliment. I’m always striving to get better. Yes, walking away before the camera is done taking the picture can be a problem. Ha, ha. I hope your new camera works out. I’ve found that shutter speed is the most important so set it to at least 125 if you can adjust it on that camera.